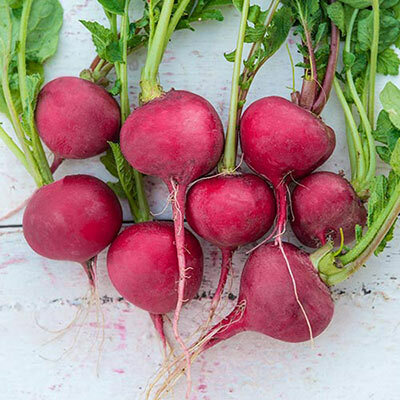 Cherry Bell Spring Radish is an All-America Selections winner that is tasty and matures in little time-just 21 days from seed to plate! It has a mild flavor and a bold red hue that adds color, flavor and crunch to relish trays, salad bowls and more. Keeps well in the refrigerator, too. Extend the radish growing season by sowing Cherry Bell Radish seed mats in spring as soon as the soil can be worked. Continue sowing ever 10-14 days until four weeks after the last spring frost. Radish seed mats can be sown in the summer, too, about 4-6 weeks before the first fall frost. 21 DAYS. Height 2.5 - 3 inches. For each offer ordered, get 12" x 12" 85 Seed Mat.